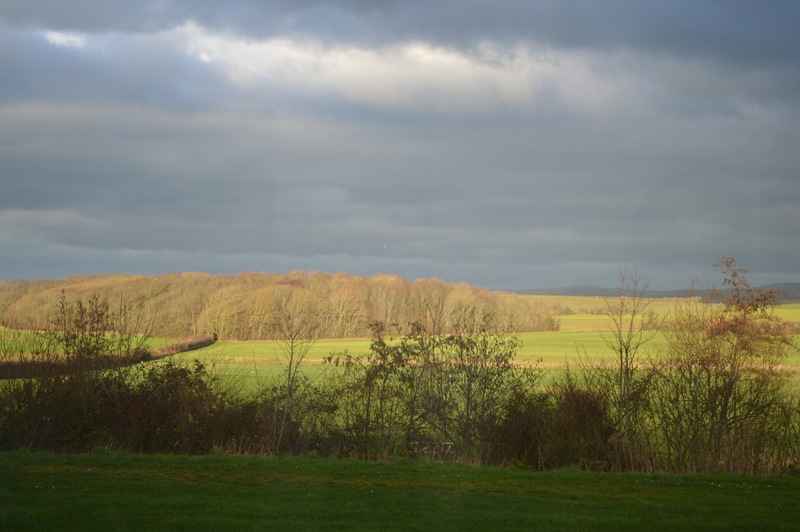 It has been a disappointing couple of weeks as far as the weather is concerned, as the initial promise of sun and warmth didn’t actually materialise and it stayed changeable, with loads of rain and wind and short sunny breaks in between. 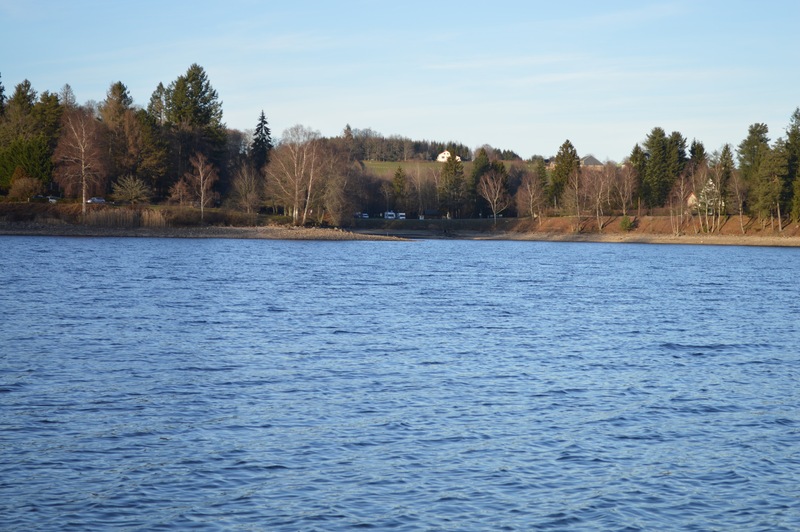 Still, we did enjoy our relaxing time at Lac de l’Uby and were able to sit outside on and off and even enjoyed a couple of spectacular sunsets by the lake, as usual. And, of course, Adonis enjoyed his carp fishing, catching a total of 6 fish during our stay. 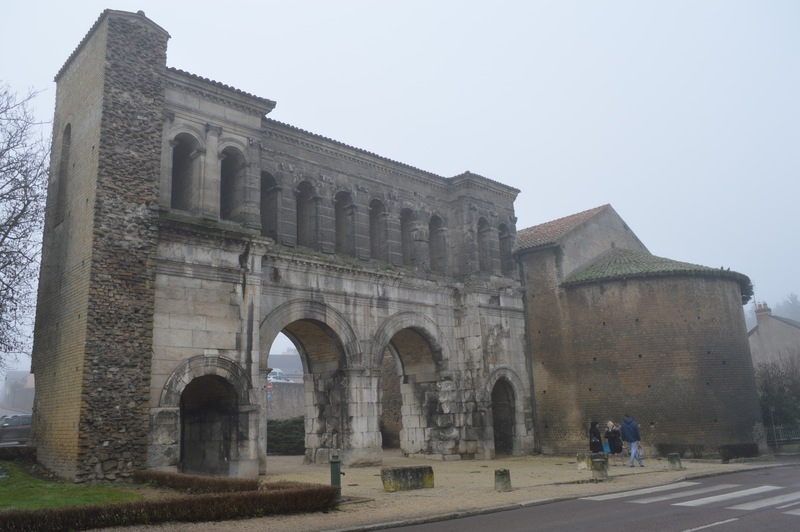 We alternated our shopping between Barbotan les Thermes and Cazaubon and I had yet another puncture on my bike on the way back from the latter, but at least this time I was closer to the campsite. Time to change my bike, me thinks…. My friend Dani arrived on the Thursday afternoon before we left and, therefore, we only and a few minutes to enjoy together and no chance to have a crochet session like we’ve done in the past. This was a real shame, as I love listening to her speaking in French, which helps me an awful lot too, as I have to force myself to think in that language. It is all very well to read magazines and books, but to speak it is a different kettle of fish althogether, which is the main reason why we learn another language. Dani had made some mackerel pate and gave us a big kilner jar, which we have been enjoying for the last few days and when I say ‘we’, I include Beano too: he’s got good taste! A new discovery in Barbotan les Thermes this year was a fantastic little restaurant in the centre of town called L’Estanquet, where we had a lovely Sunday lunch with a jug of their local white wine. The food was magnificent and it was finished with a delicious Café Gourmand, consisting of a cup of coffee and little samples of various puddings: I highly recommend it! 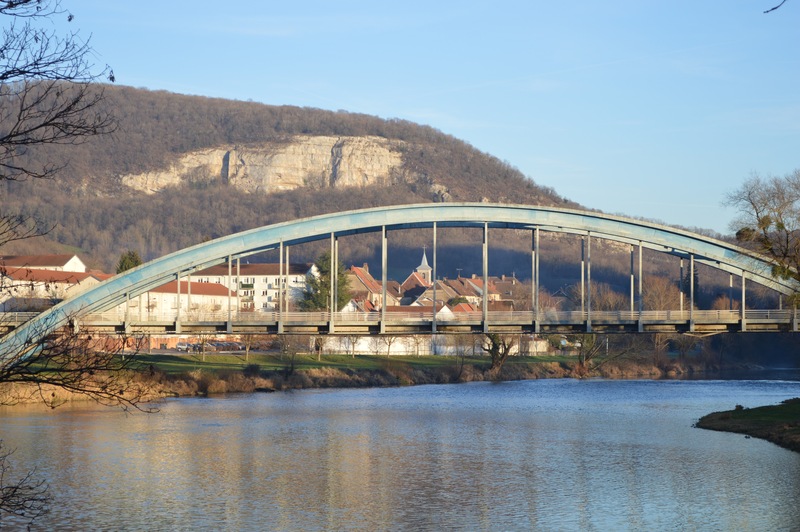 On Friday morning, after a small shop at Intermarché at Cazaubon, we started our journey back north, our first stop for the night being at the aire in Roulet-St-Estèphe, just off the N10 south of Angoulême. 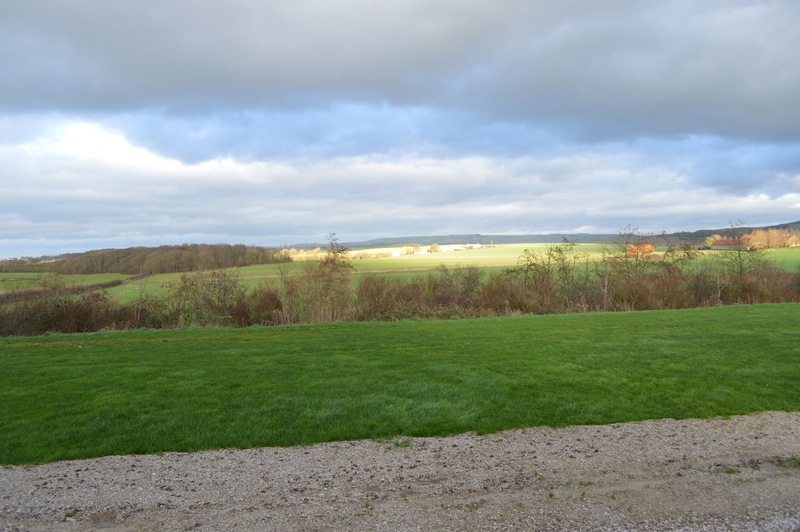 We were surprised to see how busy it was compared to the first time we came here last Easter, so much so that in the morning there were no more parking spaces left and a motorhome had parked on the other side of the road dedicated to buses and coaches. It is a lovely free aire in a very pretty location and with a wonderful walk for Beano at the far end and following the stream. We also saw some large otters feeding on the field right in front of us, which is a very unusual sight indeed! We continued our journey north on the N10 past Augoulême, Poitiers and Châtellerault on Saturday morning, when we were unfortunate enough to come across the aftermath of an accident that had occurred at around 5 am between junctions 25 and 26, where a large lorry was still on its side, almost straddling the north and south lanes, waiting to be towed away and causing major delays in both directions, adding a whole hour to our journey. So we carried on the A10 all the way to north of Tours and then the expensive A28 to J. 26 (€6 for just one junction) just to make up some of the time we lost due to the accident. 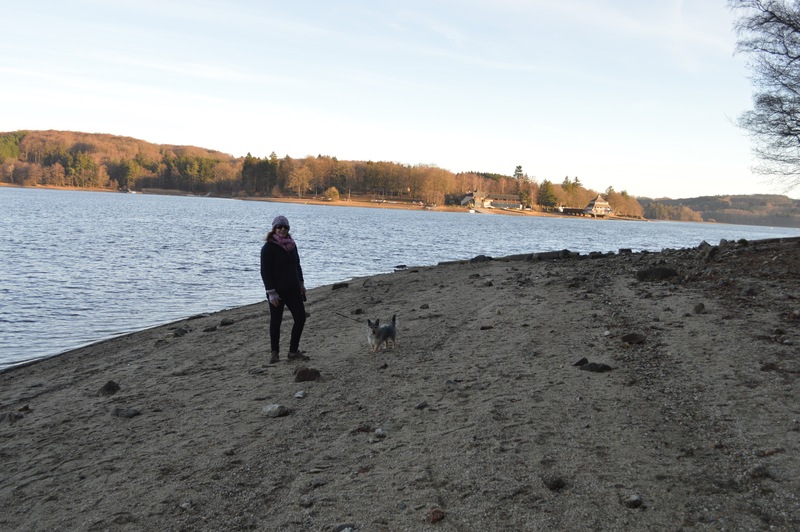 We spent Saturday afternoon and night at the lovely free aire in Vaas, which was very peaceful and quiet, and continued north to Broglie yesterday morning for our appointment with the vet this morning. 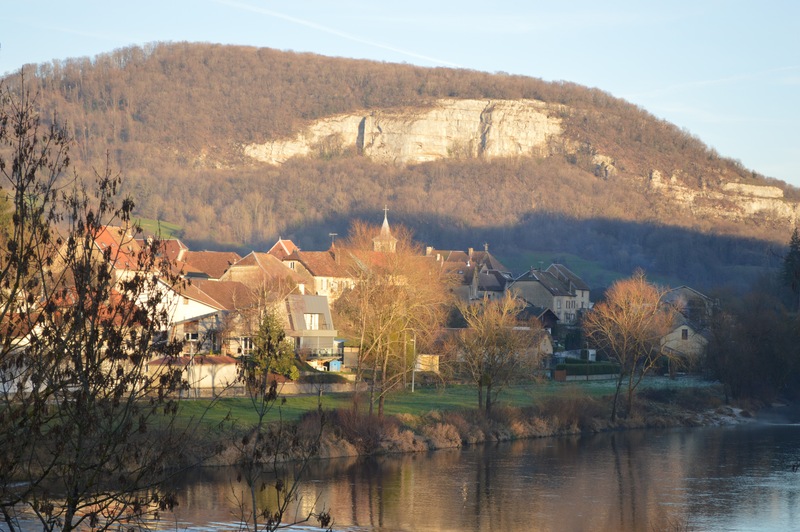 We never get tired of Broglie, no matter how many times we’ve been here, and that walk along the Charentonne river to the water mill has a charm all of its own, which is a great medicine for the heart and soul. I took Beano for his usual afternoon walk and then I went back again just to photograph that most soothing of views overlooking the valley, river, water mill and half-timbered houses: priceless! This morning’s visit to the vet was a bit eventful, as Beano wouln’t take his worming tablet required for re-entry in the UK and even my usual trick of wrapping the tablet in a bit of fish mousse didn’t work, nor did the vet’s attempt with a creamy cheese triangle, so in the end we had to opt for an injection, for which purpose Beano had to be muzzled and restrained by myself and the receptionist while the vet did the injecting! Not a performance I would like to repeat, I daresay! After that dramatic experience we set off again, this time headed for Quend-Plage-les-Pins, another wonderful aire surrounded by pine trees, as the name aptly discribes. We came here in January 2015 and it was nearly empty, but again, today it is rather busy, even on a Monday. The ticket machine is still not working, so we’ve saved €7 again, like last time! Beano’s afternoon walk today was on the trail through the pine woods, where I was pleased to see some young people doing a tree-top adventure trail, what we know in the UK as Go Ape. I wouln’t mind having a go myself, as it looks like a lot of fun. Afterwards, Adonis and I walked into town and the sea front and enjoyed looking at the high tide breaking against the promenade walls and the children chasing the waves: great fun! Chasing the waves: priceless fun! It’s back to Wissant, Pas de Calais, tomorrow and then home. We’ll be back in May. We are being buffeted by very strong winds on this very wet and wintery day. 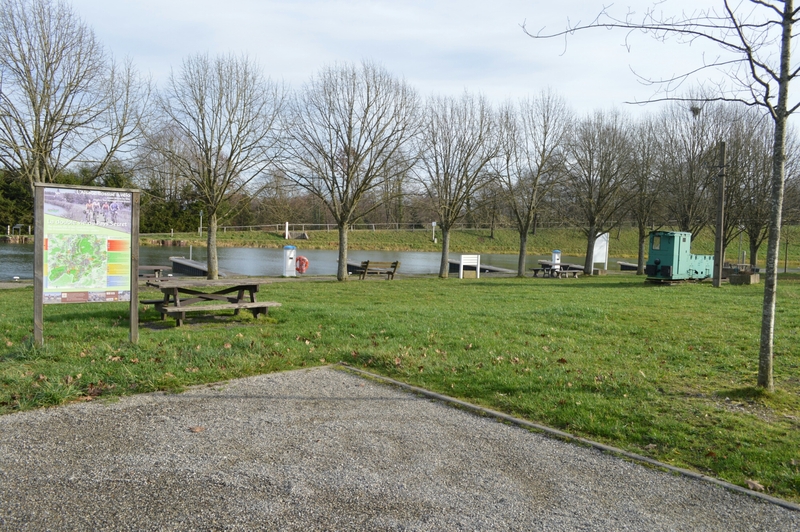 We came here after doing our usual shop at Auchan in Boulogne-sur-Mer and trying the campsite at Escalles, Les Erables, but this doesn’t open till 31st March and, as we still want to have E.H.U, we thought we would give this farm a go. 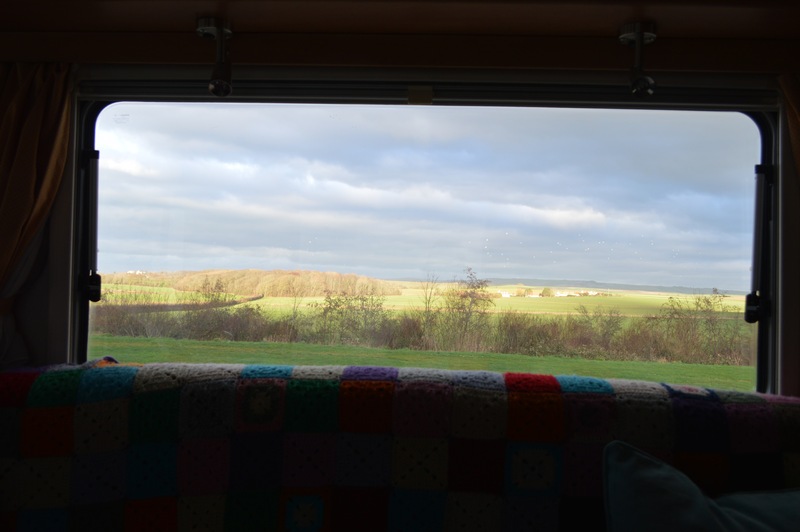 We are parked behind the large barn, which is sheltering us from the wind slightly, and we have wonderful views of the surrounding fields, woods and even the sea at Wissant! The light keeps changing with the comings and goings of the clouds, making it all very attractive and interesting to look at and I should think that in better weather it would be just marvellous. Our stop at La Suze-sur-Sarthe was lovely as always and we enjoyed our walks along the river Sarthe before moving north to Rugles, where we were able to hook up again in the free motorhome aire and were glad to find all the shops open this time and treated ourselves to a nice pizza Normande, with lardons and Camembert cheese: simply delicious. 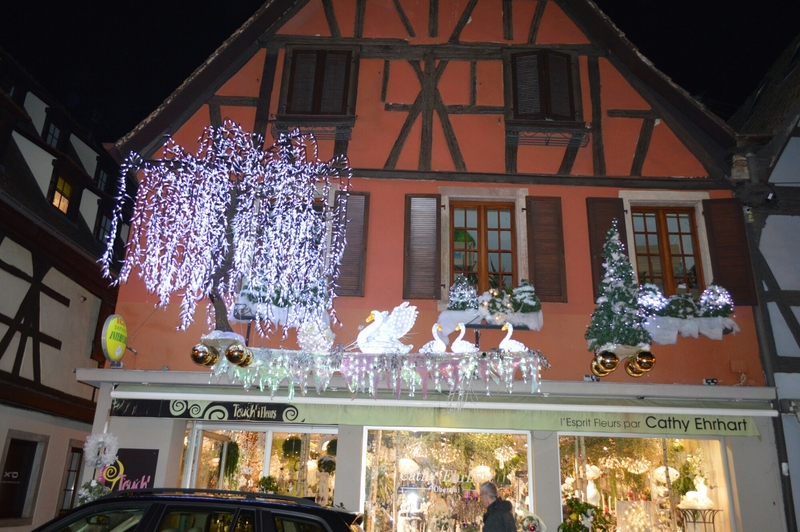 Yesterday, we stopped at the aire in Neufchatel-en-Bray and took Beano for his pet passport check-up and tablet and were ready for departure by 10.30am. I must say here that we had a little panic when leaving the aire, as the automated payment machine wouldn’t accept my bankcard. Adonis tried his, but it was also declined, but was finally able to pay with one of his Visa cards. We then inserted the exit ticket into the machine by the exit barrier, but the notice kept saying to insert a ‘valid ticket’ and wouldn’t eject the one I had just inserted. Luckily, there was a plumber working on the newly built extension to the services hut and he kindly used his staff card to open the barrier for us. Apparently, we inserted our ticket in the exit barrier machine before approaching the barrier fully and even though we drove right up to it after inserting ticket, it just wouldn’t work: One must drive right up to the barrier before inserting ticket! Lesson learned and will remember in future. 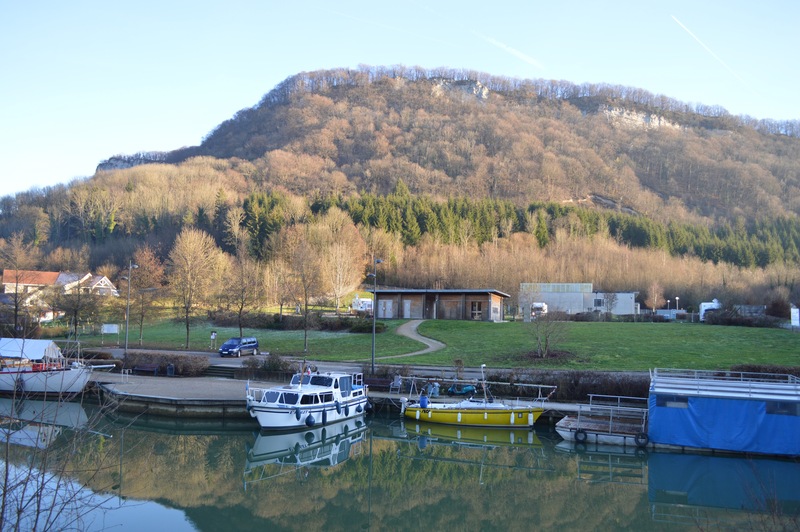 Other than that, this is an excellent aire for €13 a night in a lovely town and close to supermarkets and an excellent dog walk just outisde that goes for miles as it is part of a cycling route to Dieppe. Due to the leisure battery playing up, we are thinking of crossing back to England tomorrow instead of Saturday, as there are no more motorhome aires in the area providing E.H.U. Safe inside enjoying the light! 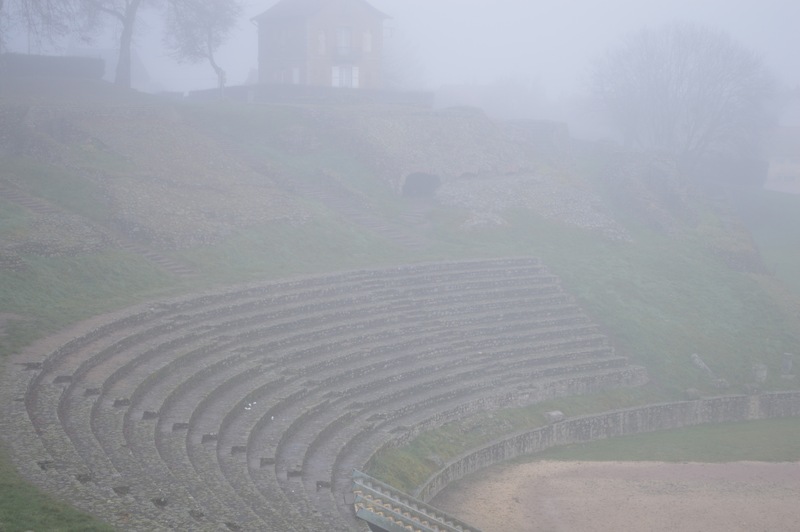 Back to France for Easter holidays, destination: Barbotan-les-Thermes! 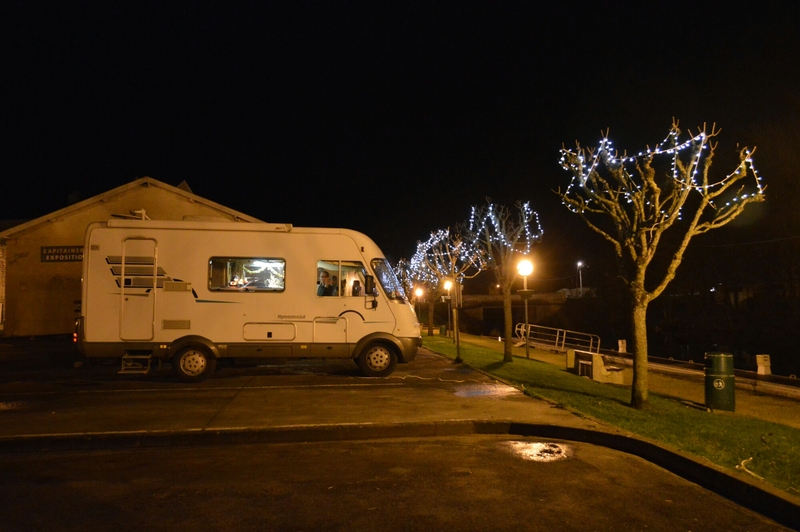 We spent a very quiet New Year’s Eve at this superb motorhome aire by the Marina in Châtillon-sur-Loire and we liked it so much, we decided to spend New Year’s Day here too. 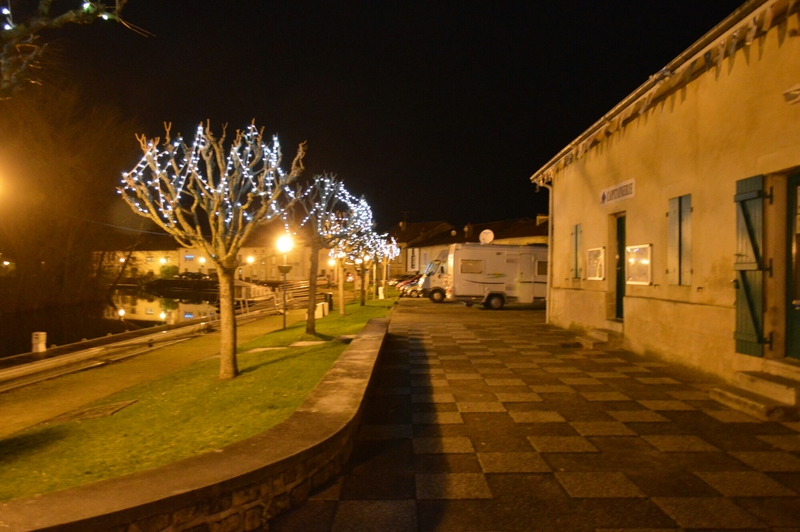 The aire is on gravel, with hard standing access and paved areas with picnic tables between the parking bays, all facing the canal with its charming boats and barges, some beautifully decorated for the Christmas festivities. 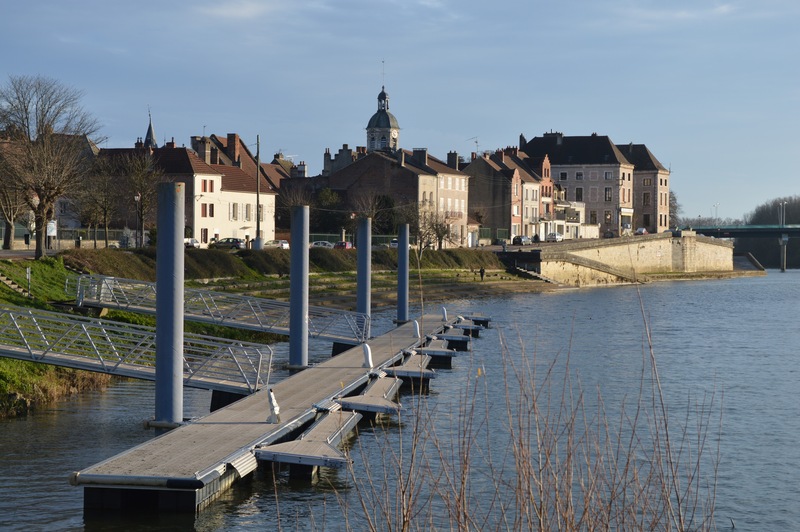 The payment of €9 for 24 hours is at machine near the Capitainerie on entrance to Marina and it includes water and electricity, for which you first need to know your bay letter in order to activate the electricity power. There were 3 other motorhomes here last night, as well as people in some of the boats, but is was so quiet you wouldn’t have known it. 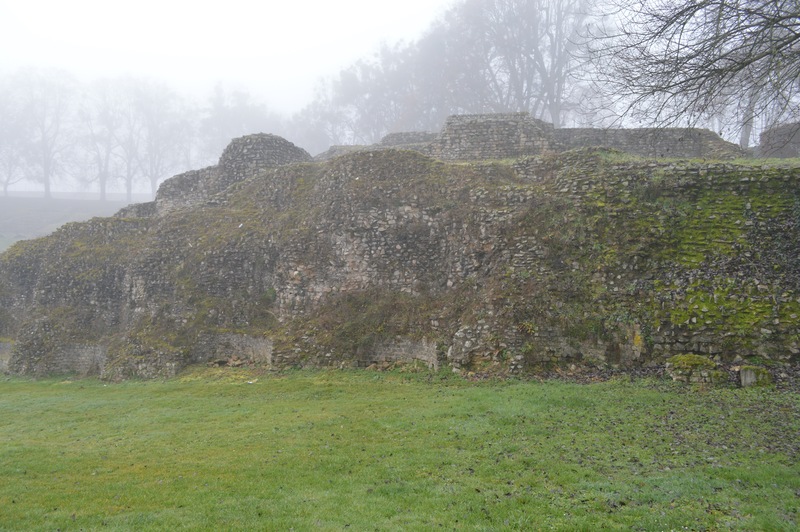 Our arrival here was a bit of a labour of love, as access to the town for high vehicles over 2.7 metres is only available from the north due to a height barrier on the south side. 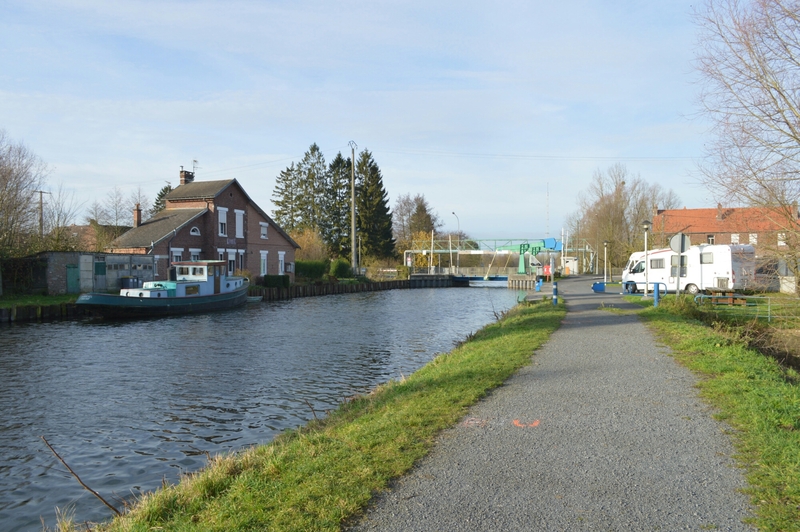 As we were coming from the south east, we were obliged to carry on the D2007 and D952 all the way to Gien, just over 6 miles, to cross the river there and back down south on D951, adding a total of 12 miles to the journey, as well as time. Still, we were here for 1.30pm and were delighted with the location and thought the extra mileage and time were definitely worth it. 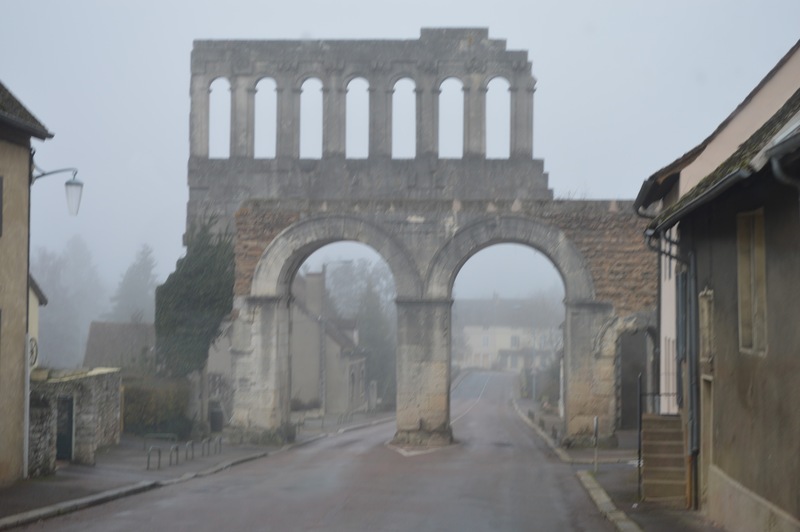 We didn’t make it to Chiddes, as we had planned, simply because we needed to do our food shopping for last night and today and we didn’t see a supermarket on the outskirts of Château-Chinon after leaving Les Settons. Therefore, we continued our way west on the D978 and found an Intermarché Contact in St Benin-d’Azy, where we bought some sakate and cooked crevettes for our New Year’s Eve meal, which were absolutely delicious, and two rump stakes for tonight. I cooked the skate simply à la Romana and served it with new potatoes and we enjoyed it with a bottle of Blanquette de Limoux and a bottle of Touraine and we had a jolly good time with a game of Cribbage and an episode of Boardwalk Empire before retiring for an early end to the year at the tender hour of 9.30pm!!! Today’s been a lazy day, as it is meant to be, and Adonis enjoyed a spot of fishing in the morning while I did some crocheting, read my Marie France magazine and revised a bit of German on my new app. After siesta, we went for a stroll into town and enjoyed the lovely old houses, Christmas decorations, the stained-glass windows in the church St Maurice and St Posen, dedicated to a 6th century shepherd and hermit, and the original murals all over the town, part of a project to decorate the locality, “Decorer la ville” organised by Arterial Association in order to bring local artists together and closer to the public: all very attractive and interesting. We woke up to a beautiful frosty morning in La Porte d’Alsace on Monday, with icicles hanging from the wheel’s arch below the heating outlet, with the thermometer saying -2°C. 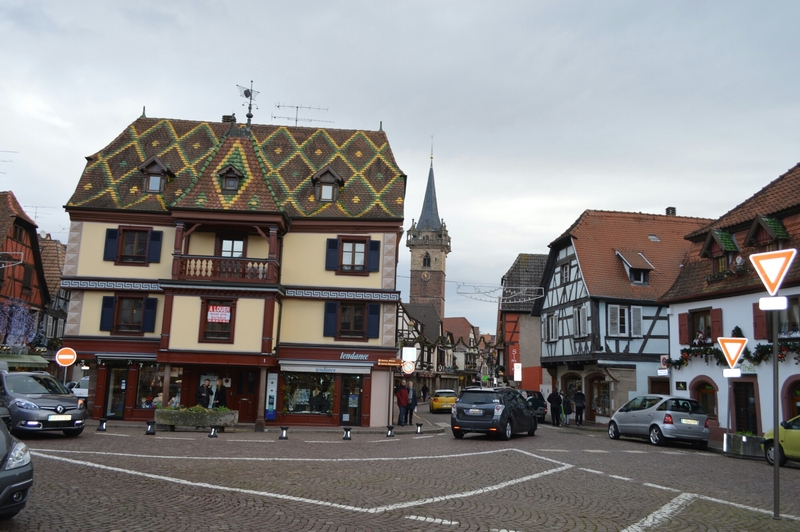 We set off on the D419 again and A36 past Belfort and Montbéliard to junction 7, as we needed to do a shop, and tried our luck on the national road D633 and got lucky at L’Isle-le-Doubs, where we found an Intermarché to buy provisions for the next 3 days. 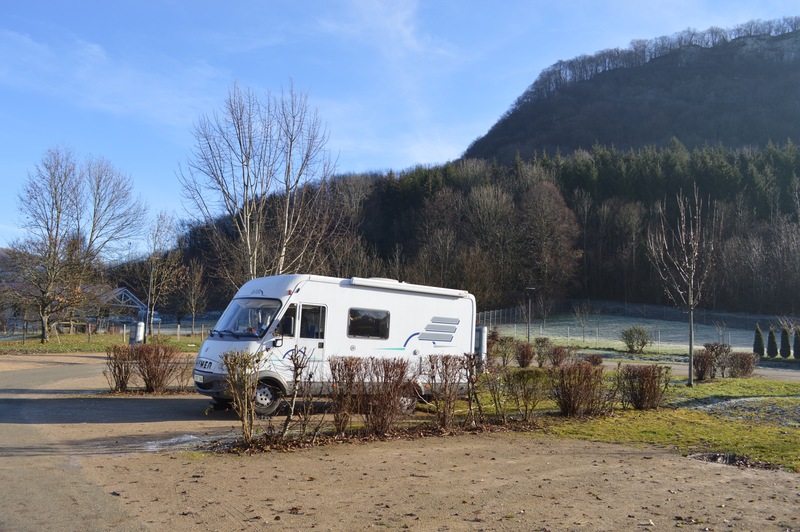 From there, it was a short drive to Baume-les-Dames, which we found covered in frost and were spoilt for choice of pitches at this large aire, as there was only one more van getting ready to leave. We hooked up and filled up with water and, after lunch, had a lovely long walk along the canal and river Doubs. The Reception hut at the motorhome aire opened at 5.30pm for payments, by which time there were about 8 motorhomes to stay for the night. The fee was €9.90, which is a fair price to pay this time of year, as it is good of them to keep the water and services running in freezing weather. 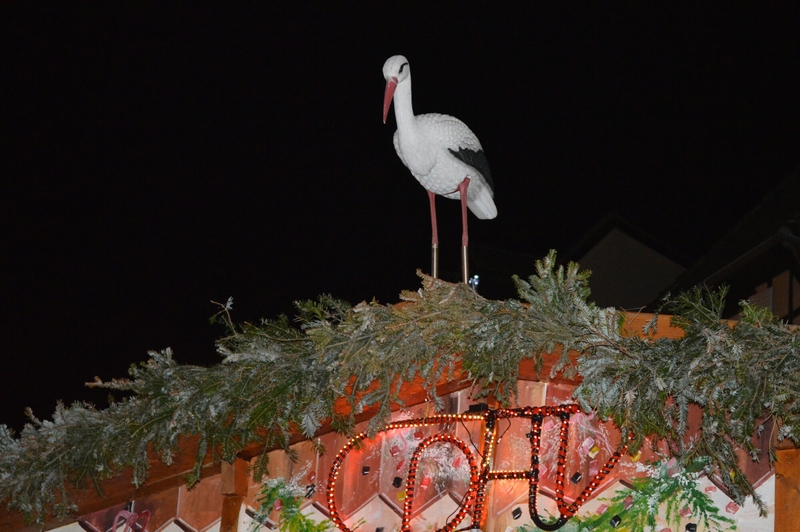 I loved the original Christmas decorations outside this house! 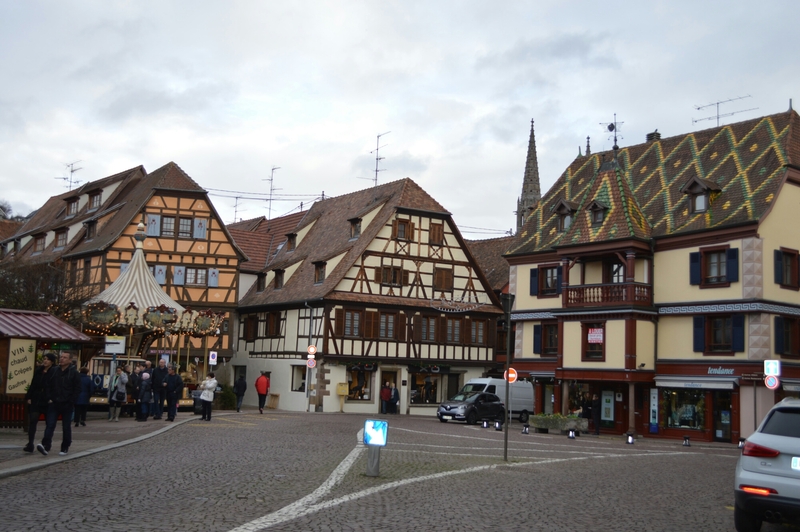 From Seurre, we followed the D973 past Beaune to Autun, where we had anextended coffee break this morning at the aire by lake and Roman Theatre. 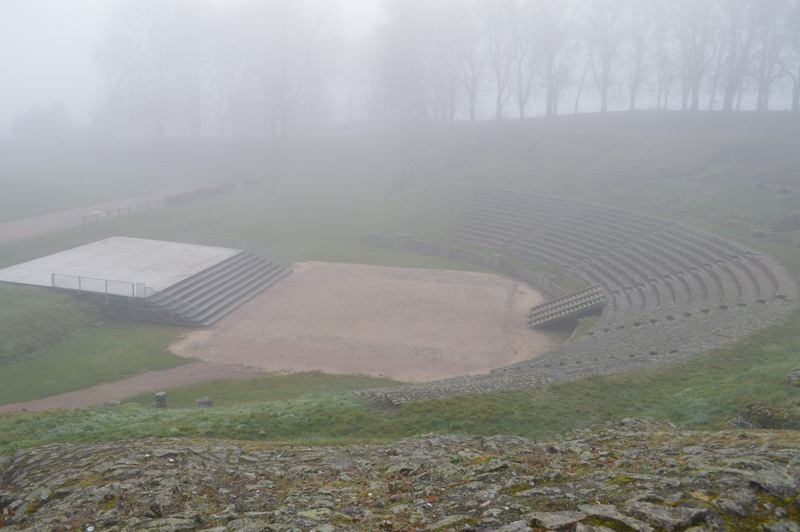 The lake had been drained to get all the fish out, but the walk through the Roman Theatre was quite a treat, despite the heavy fog, and we thought it might be nice to return in spring when the lake has been filled again and to visit the rest of the town. 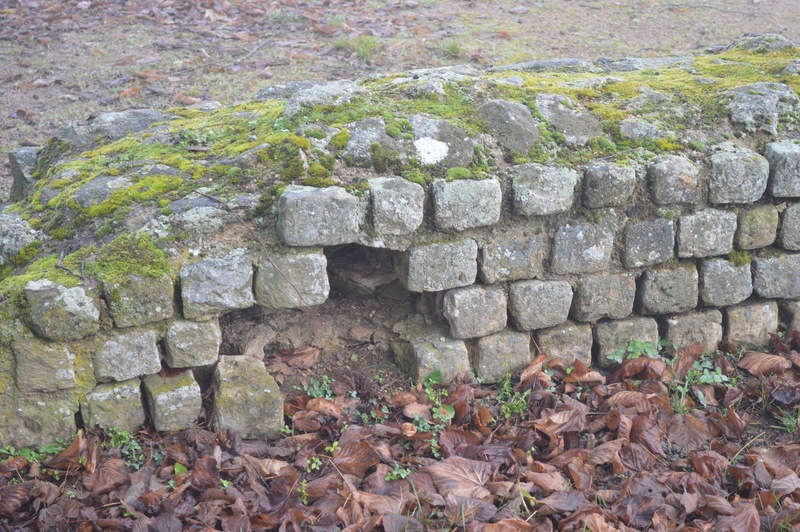 On the way out, we saw the two Roman Gates too, which are quite impressive. 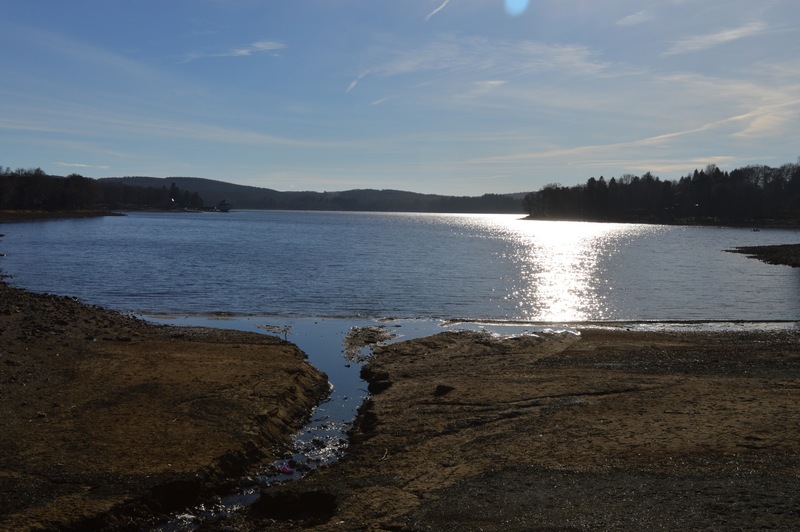 Still seeking a lake, we headed north on the D960 to Lac des Settons, near Montsauche-les-Settons, part of the Grands Lacs du Morvan, where we finally stopped for the day and night. It really is beautiful here and I can see this would be a very popular summer holiday resort, as there are various outlets for boat rides around the lake, as well as bars, restaurants, hotels and a campsite. We went for a long walk around the lake and both sides seem perfect for a family summer holiday. 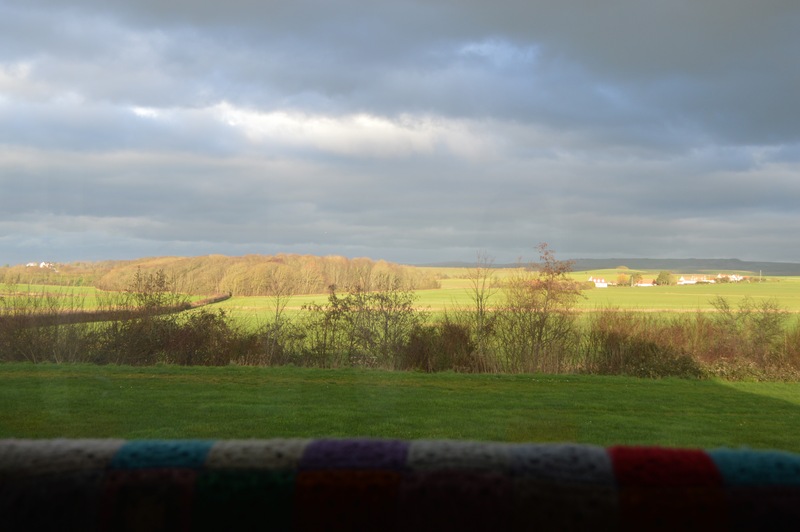 It’s been a bit warmer today, temperaturesrising to 7°C, and we’ve had a lovely sunset. 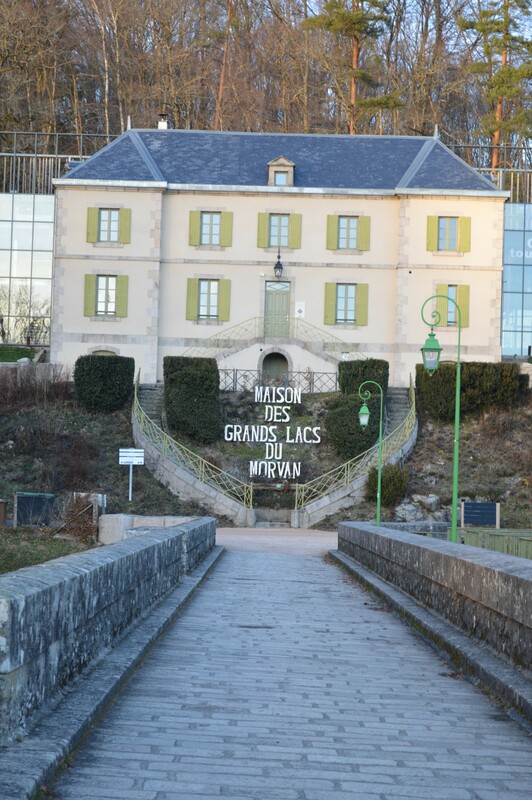 Tomorrow, we are heading for Chiddes, about 18 miles south of Château-Chinon. 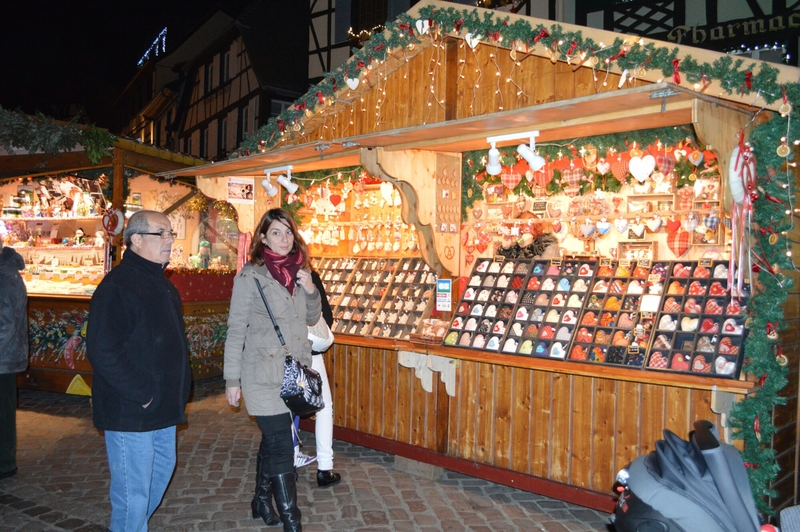 We made it to Alsace for Christmas as we intended and we are certainly not disappointed with our choice. 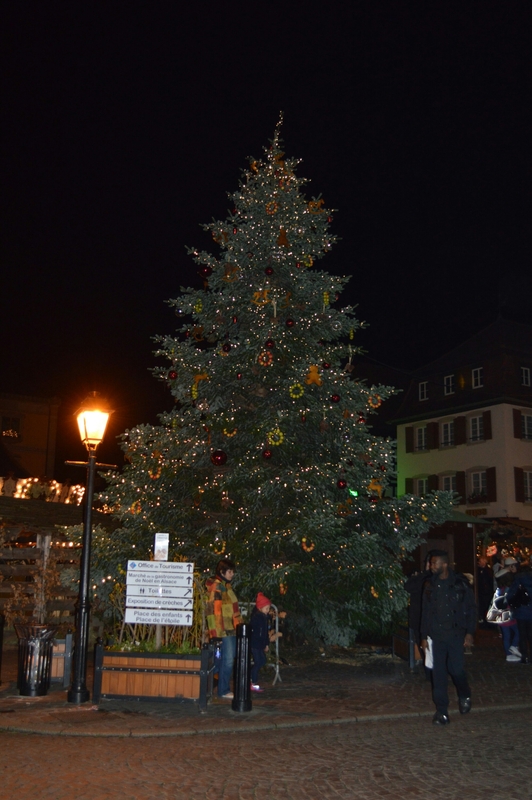 We loved Obernai when we came here in the summer a couple of years ago and we just knew it would be beautiful at Christmas. 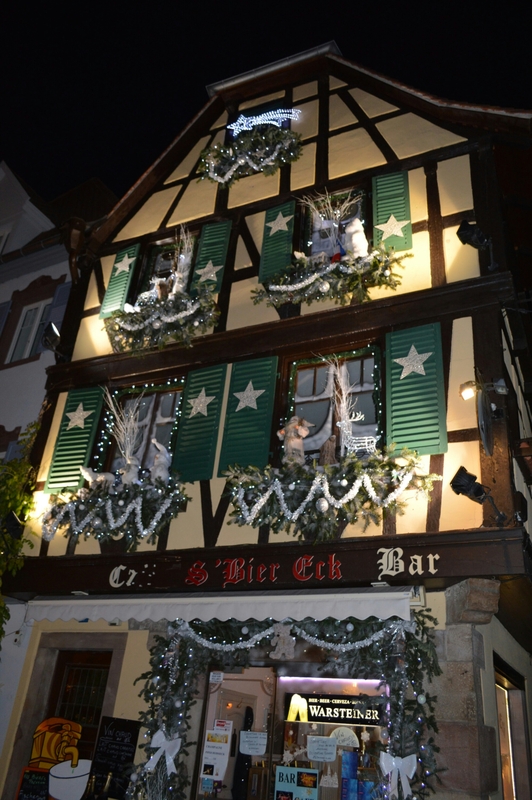 The whole place’s got a very special atmosphere, all made possible by the Christmas market stalls, the street and houses decorations, the festive people and, of course, the mulled wine! 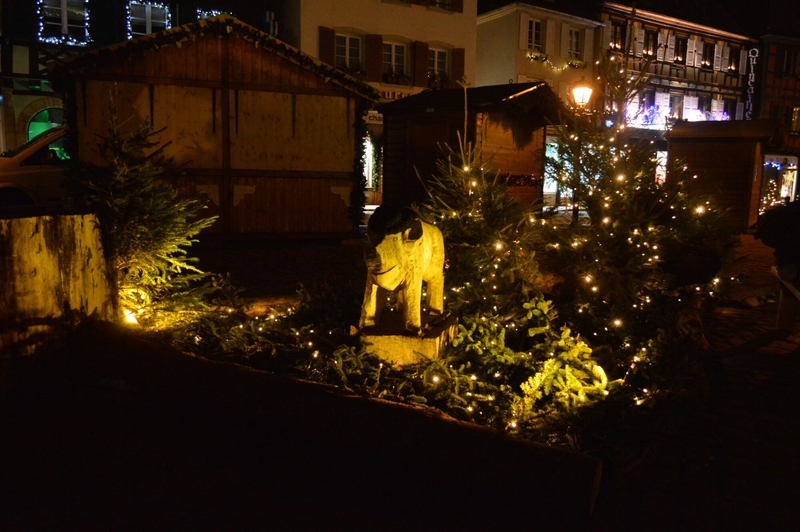 We arrived at the Camping Municipal Vallon de l’Ehn yesterday morning and, after hooking up and giving Beano a little walk around the campsite, we set off to explore the town and soak up the spirit of Christmas, so beautifully done here. 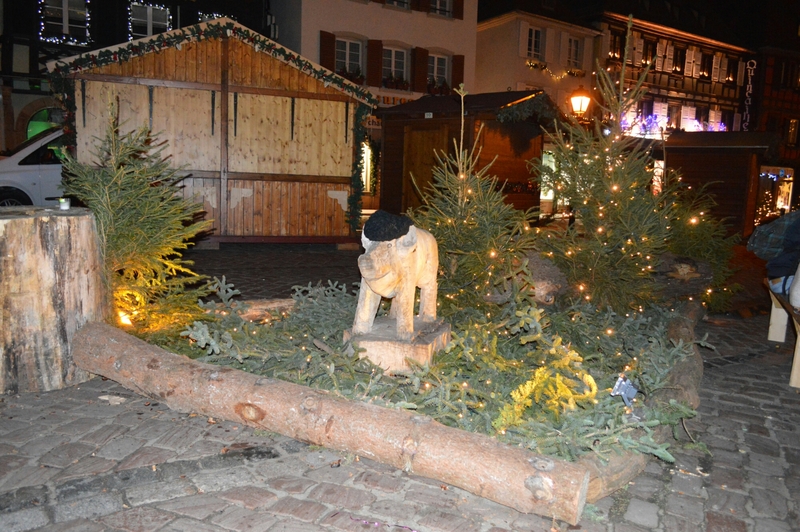 We loved the whole thing: the various wooden huts selling all kinds of goods, the Manger with life size figures and real sheep and donkey, the train ride and carrousel for children and seeing everyone enjoying themselves sipping a glass of mulled wine and munching on roasted chestnuts, which added to the seasonal atmosphere with the lovely scents. We bought a couple of bottles of Crémant and Cordon Bleu Snitzels for tonight and came back to the van for lunch and Beano’s afternoon walk. 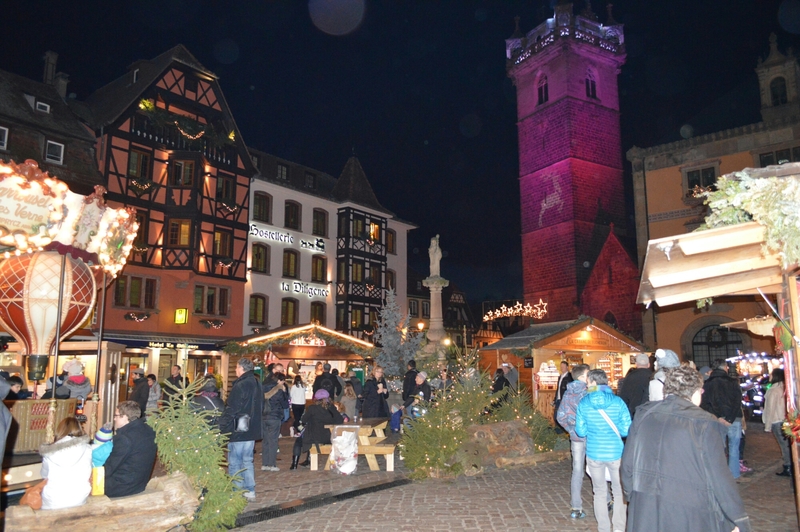 We returned to the town in the evening to see it all lit up and enjoy a glass of Bière de Noël and, of course, the ubiquitous mulled wine to make time for dinner. We tried a couple of restaurants, but they were fully booked, but struck it lucky on our third attempt at La Halle aux Blés, where we had a hearty meal of spare ribs and chips for Adonis and Escalope Viennoise for me, all accompanied by a lovely pitcher of Riesling. We were delighted with our choices and the generous portions and felt a bit too full for pudding, which we decided to leave for Christmas Eve and Christmas day. So we staggered back uphill to the campsite and had a good night’s sleep with just the slightest threat of a headache that, thankfully, didn’t go full blown. 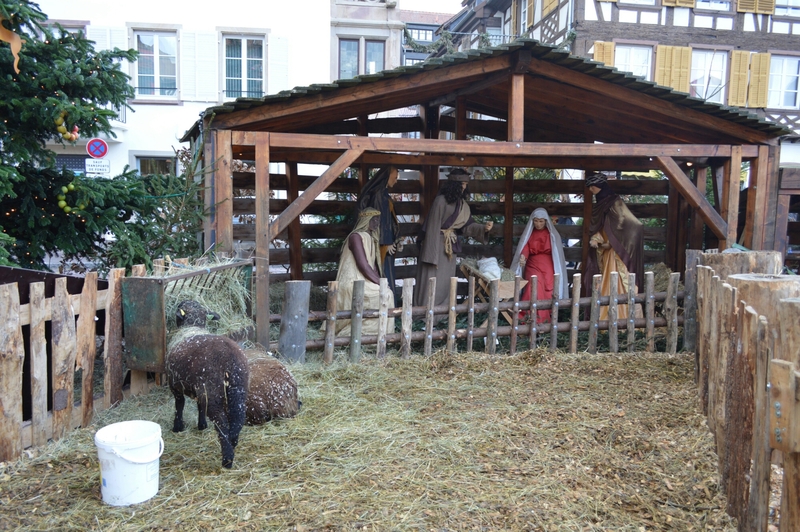 This morning, we took the bus into town and bought a chicken for tomorrow and a veal pie for Boxing Day. The idea was to buy an already cooked chicken, but as we hadn’t seen any outlets yesterday and we didn’t want to risk going without on Christmas Day, we bought a fresh one from the local Traiteur, only to find later on that the full-on market was on with no less than 3 outlets for ‘Poulet roti’!!! We had a good laugh about that and now we know for next time. It’s a lovely sunny day with blue skies today and, although it is not frosty, it is just perfect for Christmas. We’ve just taken Beano for a long walk along the stream and are enjoying a refreshing beer in the sun. The drive here went without a hitch, stopping at a very empty Wissant aire the first night, by the canal at Catillon-sur-Sambre east of Cambrai on D643 on Saturday and 2 nights at Stenay, the first night by the Capitainerie, as there was no-one to give us the code to enter the proper aire, but the guard came in the evening and gave us the code for the next day after paying our €9 fee. 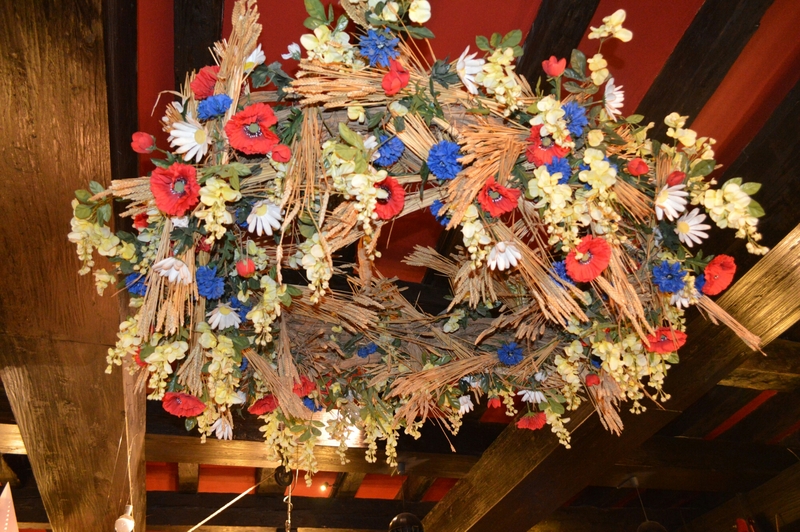 Stenay was also cheerfully decorated for the season. Finally, we stopped for one night at Harskirchen by the Port de Plaisance, all very quiet and peaceful and free this time of year. 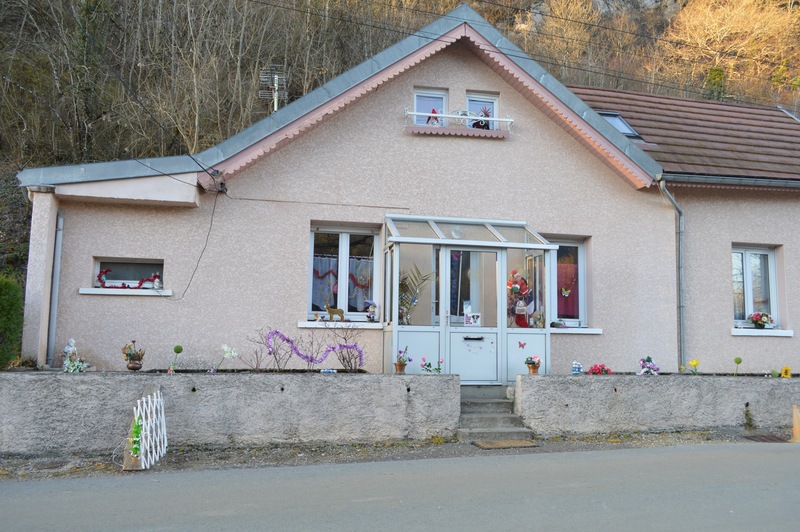 No matter how small a place is in France, it always has something different and wonderful to offer the visitor. 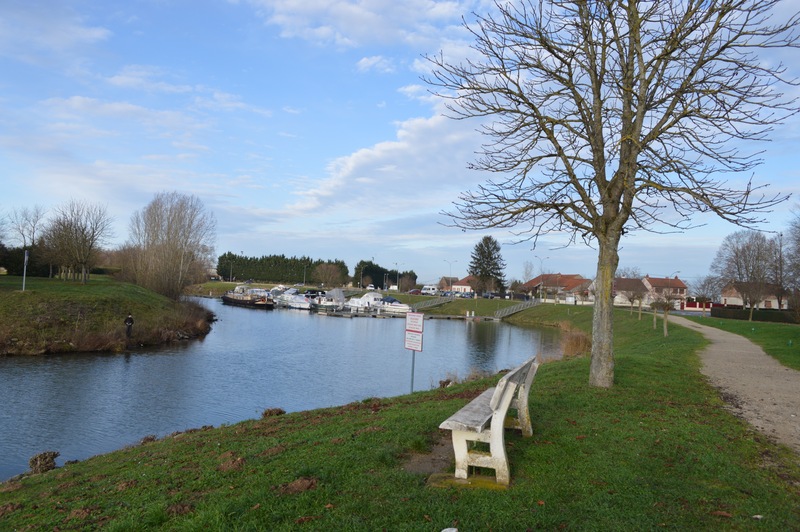 We have found another lovely free aire at this pretty village on the D7 slightly north west of La Ferté-Bernard, right by the little stream and pretty bridge with easy access to the shops and restaurants. The aire has a borne for water and electricity, but it is out of order at the moment, maybe because the area is under renovation and they are still laying gravel in the aire, which is by a brand new recreation ground for football, basketball, tennis, etc, as well as a children’s playground. All in pristine condition, very clean and tidy. As usual, we went for a walk around the village to get our bearings and we admired the quaint old houses and the stream going under some of them. We wondered if they ever get flooded in heavy rain! Still it is a charming little place with a very good boulangerie, which has won a golden award in the last 2 years and where we’ll get our baguette and cake in the morning. It’s back to Broglie tomorrow for Beano’s check at the vet’s and Le Crotoy on Thursday.